Simply the best sport handling available! Fully Adjustable ride height front and Rear. Gone is the jelly feel and in comes the stance and purpose of a true RS. We use are demo car every day as a family run around to and from school and on the mid setting find this adds feel and precision to the ride. In our opinion these are perfect to add a 'Road Sport' feel. The Pumaspeed Workshop team are ready to fit the KW coil over suspension kit - ST225 V1 in our Head Office located here. Therefore making parts and labour a total cost £1,234.00 (inc. VAT). 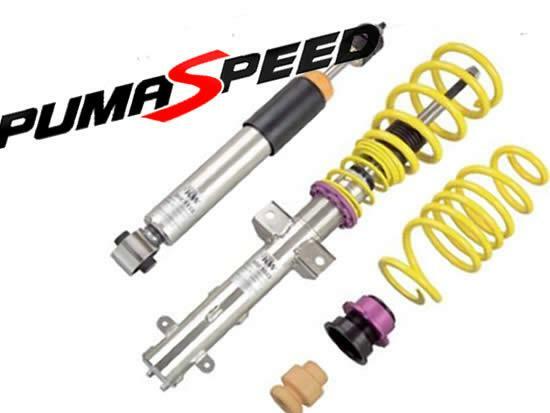 Pumaspeed have a specialist distribution team that can dispatch the KW coil over suspension kit - ST225 V1 to any destination worldwide.